Ramen Danbo has become one of AngryRussian and my favorite places to eat on our movie date nights (although we’ve really only been here twice). The Vancouver location is within walking distance from 5th Avenue Cinemas, and is perfect for a quick and delicious meal. We can usually get in and get out of there within 40 minutes. My go-to at any ramen place is always the tonkotsu (pork bone broth) and it was no different at Ramen Danbo. Their version is called the Classic Ramen ($9.75). When you order you also tell them your preferences. You get to choose thick or classic thin noodles, noodle firmness, soup richness, soup thickness, and amount of spicy sauce. For my first time, I chose thick noodles, standard soup richness and thickness, and no spicy sauce. I also added a soft-boiled egg ($1.50). I thought the soup was way too salty the first time. Waaaaay too salty. I couldn’t even finish all the broth. I also didn’t appreciate the discrepancy in the amount of green onions in the picture and in real life. AngryRussian of course got the spicy broth which is the Classic Rekka Ramen ($10.75). “Rekka” here is the addition of Ichimi Togarashi Powder. He also got medium spicy which is the amount of spicy sauce you see in the middle. I tasted the sauce by itself. It’s got kind of a smoky spicy flavor but nothing else apart from that. AngryRussian REALLY enjoyed it. The portion sizes are pretty small. The bowl is quite tiny, but there’s enough food in there for me. AngryRussian though added an extra half order of noodles for $1.00. 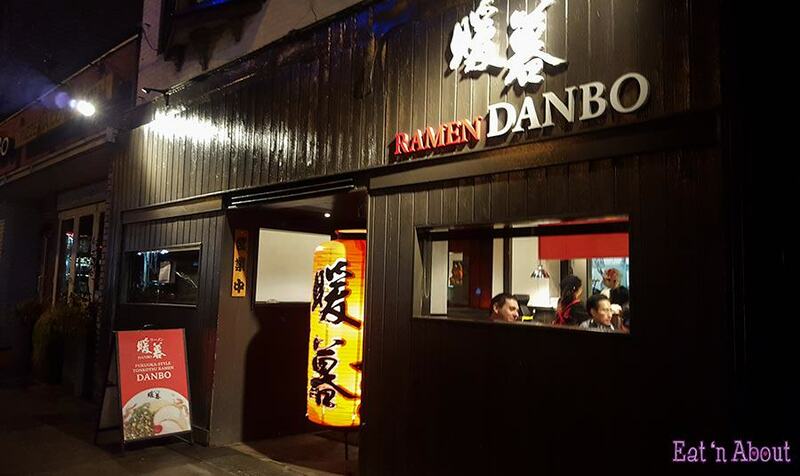 The second time I went I had a much better experience, which solidified Ramen Danbo as one of my favorites. AngryRussian got the same choice as last time, but I got the Negi-goma Ramen ($11.95) with two extra slices of chashu ($1.50). The soup base is still tonkotsu but has more green onion (negi) and the addition of sesame seeds (gomae). No choice for soup richness here. This time the soup was much less salty and was much tastier. The four pieces of chashu proved too much for me though. I also found the standard noodle firmness this time to be too firm, so I think I’ll opt for “soft” next time. You are able to add different toppings such as nori and cloud ear mushroom for extra charge, which is a minus since other places usually include at least some for no extra charge, and $1.00 for nori is a bit absurd. Having said that, the soup is where it’s at and when it’s done right it’s really good, which is why I still say Ramen Danbo is one of our favorites.